■ 알리앙스 비바체는 이전제품을 한 단계 업그레이드시킨 제품입니다. 을 이용한 현의 개발을 하고있습니다. 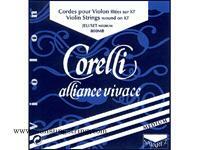 The CORELLI ALLIANCE VIVACE strings are the result of a know-how in the process of the composite fibre for the core of the string combined with high characteristics metals. Corelli is the only one to master these materials and to have the sufficient knowledge to adapt the ALLIANCE KF composite fibre to the use of harmonic strings for guitar, lute, harp, violin, viola and for double bass. In fact, CORELLI has been able to solve the technological problems first inherent to the material in order to guarantee the technological and acoustic quality of these one of a kind strings. - control of the geometrical regularity of the diameter for a perfect intonation (thanks to a very specific and sophisticated extrusion technology). CORELLI thoroughly master this high-tech product which combined with high characteristics metals provide very high quality strings . These strings represent a true innovation and advance in the field of violin and viola strings. - for all these reasons CORELLI ALLIANCE VIVIACE strings represent the best alternative to gut strings providing many advantages nobody dare to believe in. The extreme sensibility of the Alliance KF fibres, the core of the string is made up, make the string very sensible to tension. Therefore the choice of the right diameter is essential to increase the balance accuracy of the violin as well as a clear and clean sound. Our recommendation is for each note to try all the three available diameters even if the first diameter tried seems to fit. Although there is a slight difference between the different diameters, our experience shows that a slightly higher or lower diameter, i.e. tension, can bring notably improved results in the balance between the strings and the instrument but also in sound and response. The choice of the diameter can also have a positive effect on the life span of the string. It's still more especially true for viola than for violin since there is a great variety of viola instruments and the balance of some of these instruments is still more delicate. Due to their characteristics, the CORELLI ALLIANCE VIVACE strings harmonized perfectly and can easily be mixed either with gut strings or with nylon strings.